There’s no shortage of Shakespearean plays that have been turned into musicals. George Abbott, Lorenz Hart and Richard Rodgers’ The Boys from Syracuse is based on The Comedy of Errors. Cole Porter and the Speweck’s Kiss Me Kate is the trio’s version of The Taming of the Shrew. Arthur Laurents, Stephen Sondheim and Leonard Bernstein’s West Side Story is a 20th century musical interpretation of Romeo and Juliet. Now, Peter Kellogg (book and lyrics) and David Friedman (music) have done the same with another Shakespearean comedy. The show, making its premiere at York Theatre, is called Desperate Measures and it’s about a young cowboy named Johnny Blood (Conor Ryan) who is sentenced to hang for killing a man in a bar fight. Sherif Martin Green calls upon Johnny’s sister, Susanna (Emma Degerstedt), who is just about to take her final vows at a convent, to beg the lascivious Nazi-like Governor von Richterhenkenpflichtgetruber (Nick Wyman) for his life. 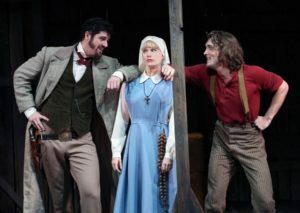 After one look at the comely Susanna (also known as Sister Mary Jo), the governor agrees he will spare Johnny, but only if Susanna will spend the night with him. If all this sounds familiar, it should. 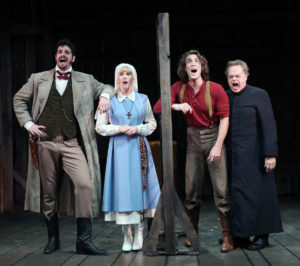 Set the musical in Vienna and Desperate Measures is Measure for Measure, with a few changes. For instance, Mistress Overdone, who runs a local brothel in Measure for Measure, is now Johnny’s girlfriend, Bella Rose (Lauren Molina), who performs in a local bar, and it is she who executes the “bed trick,” substituting for Susanna at the crucial moment. Desperate Measures is directed and choreographed by Bill Castellino with great zest. 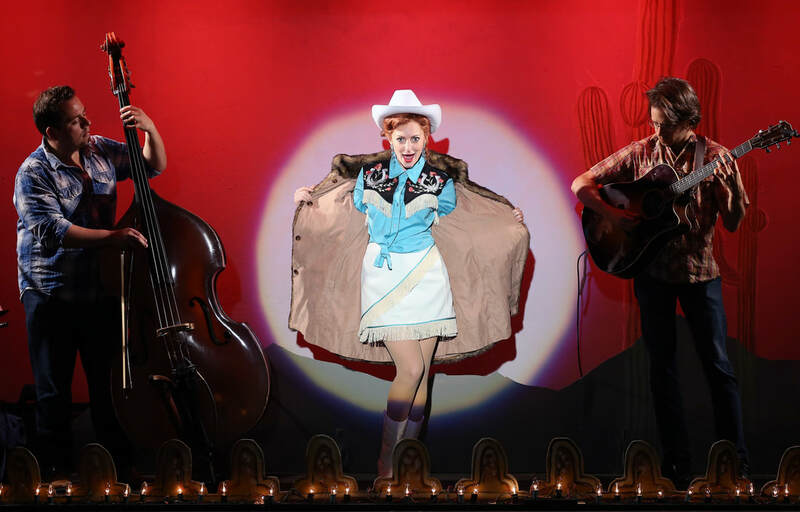 The musical makes a sly nod not only to the Bard but also to such musical westerns as Oklahoma! and Annie Get Your Gun. At the same time, it is richly sentimental with songs like Susanna’s “What Is this Feeling?” celebrating her growing love for the sheriff. The show also has lots of rowdy singing and dancing, mostly left up to Molina and Ryan. And more than a bit of broad comedy thanks to the game Wyman. If you want one side-splitting, foot stomping, hand-clapping good time, get on your horse and ride over to The York. Desperate Measures runs through Oct. 29 at York Theatre Company, 619 Lexington Ave., http://www.yorktheatre.org.